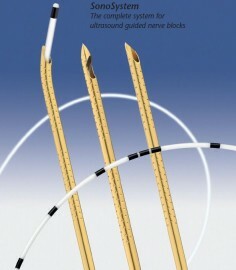 Ultrasound monitoring of regional anesthesia has become the preferred method for many nerve block applications. Today even the finest anatomical structures including peripheral nerves can be identified in detail and anaesthetised selectively using high-resolution ultrasound scanners. To improve and address this growing need, PAJUNK® developed the “Cornerstone” reflectors technology and launched a new cannula generation, with a 100%-reflection-guarantee under ultrasound monitoring. These new tools ensure the accuracy and placement of any nerve block.